Home Lifestyle Danger? Paul Robinson! If the skies are big and deep in the heart of Texas, they have no limit when viewed from the cockpit of a T-6 C Texan II! JON RAWLINSON spoke with Pilot Officer Paul Robinson about chasing his dream to catch the stick. Growing up in Glen Murray, Paul Robinson was never ‘grounded’; and now, with the world sometimes quite literally beneath his feet, there’s even less chance of anyone keeping this good man down. Air Force (RNZAF) since 2003. While he hasn’t seen much service in war zones – aside from maintaining aircraft operating in Afghanistan – many would consider flying alone to be synonymous with danger. However, with two sons in the military, Paul’s parents (Kim and Evelyn) have likely become accustomed to their boys being engaged in dangerous professions. “I guess there’s an element of concern but [my family] trusts that the training is robust and that we’re prepared to deal with emergencies and dangerous situations,” he says. My brother, Bob, spent time in Afghanistan. He was actually in bomb disposal, so Mum was probably more nervous about that than me flying!” The son of a cattle and sheep farmer, Paul adopted his father’s interest in aviation. However, seeking military over civilian wings was as much down to a martial tradition as being the result of a ‘Marshall’ experience. “My brother’s stories interested me so I looked to combine flying with a military career. 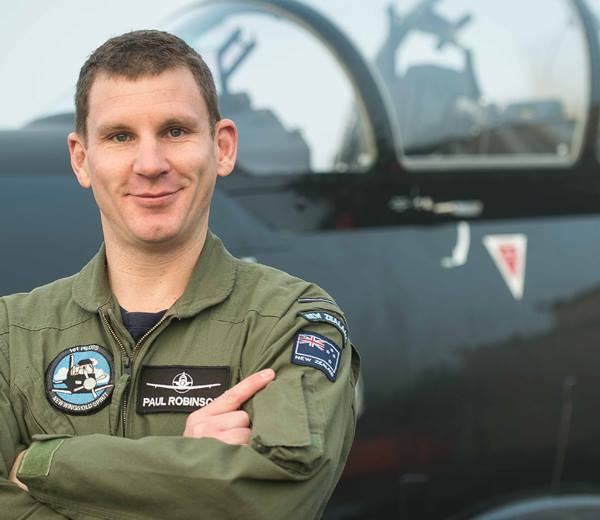 In 2003, when Paul wasn’t accepted into pilot training, he joined the Air Force regardless, becoming an aircraft technician – while many apply, few are entrusted with the service’s finest war machines. In 2013, he again applied for pilot training and was accepted. “I was disappointed on missing out first time round because I’d been working towards being an Air Force pilot throughout my school years; that had been my big plan. But, in the long run, all it really meant was that I learnt how to fix them before I learnt how to fly them,” he explains. The life of a fly boy often results in loved ones being passed like ships in the night. However, for now at least, Paul can spend plenty of time with his wife, Fiona, and two-year-old daughter, Isla. provides strong support networks to assist family of personnel who are away from home. Among those few who flew in the Second World War were many young Kiwis, fighting in skies far from home. Even if Pilot Officer Paul Robinson is not directly involved in Battle of Britain commemorations this year (usually held in September), he can’t help but reflect on the sacrifices of the fabled few. With (thankfully) no field of conflict to rush to, Paul believes it improbable that he will be called to serve in a war zone anytime soon. However, he remains ready to step up (way up!) to do his duty.